The SH-ECM-3224 is an input/output (I/O) device that interconnects via the Controller Area Network (CAN), to other electronic control modules (ECMs) in a vehicle. It typically interconnects the loom/dash controls with the various body control functions directly and via the other ECMs. 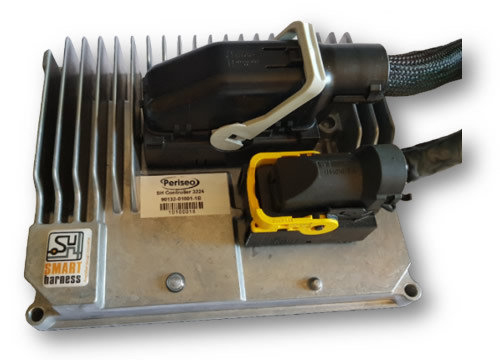 Its compactness makes it easy to install in the vehicle cab, close to the dashboard I/Os and the chassis fuse-box loom. A graphical user interface (touch screen) could be co-located for driver access and status reporting. I/Os can be configured to control and provide power to indicators, wipers, headlights, fans and numerous other loads in the vehicle. The SH ECMs are interchangeable; keeping the harness standardized thus enhancing implementation and maintainability. It may also be deployed as a stand-alone general purpose/special function controller. A sufficient number of ECMs strategically deployed throughout a vehicle, substantially simplifies the wire harness design and eliminates any need for fuse and relay circuits. Continuous total load current up to 80A. Powerful ARM™ Cortex M4 Micro Controller Unit (MCU). Two CANbus J1939 compliant ports. Compactness enable deployment at load locations. Continuous diagnostic feedback on the CAN bus. Current limits and trip delays are configurable per individual SH ECM output. Easy fitment, changes, upgrades, expansions. Internal temperature sensing: -40°C to 125°C, ±2°C. Considerable reduction in electrical wiring and installation time. Output channels can be combined (paralleled) to meet the increased current requirement. Accurate voltage and current measurements/ feedback on each output channel. Rapid short circuit and over temperature protection of the module, loads and wiring. Robust die-cast aluminium enclosure: IP67 compliant. Suited for extreme vibration and mechanical shock environments. Twenty four configurable highside driver outputs (80A total). Operating voltage: 10VDC to 36VDC. Operating temperature: -30°C to +85°C. Reverse polarity protection up to 100VDC. Physical size (mm): 197 x 157 x 49 (W x L x H).